Following a good second quarter 2017, specialty chemicals company LANXESS continues to expect the highest earnings in the company’s history for the current financial year. Global sales of the company increased by almost 30 per cent to EUR 2.5 billion, up from EUR 1.9 billion a year earlier. EBITDA pre exceptionals improved by around 25 per cent to EUR 367 million, compared with EUR 293 million in the prior-year quarter. This increase was primarily due to the earnings contribution from the newly acquired Chemtura businesses as well as to higher volumes and selling prices. The EBITDA margin pre exceptionals in the second quarter of 2017 stood at 14.6 per cent, which was slightly below the high value of 15.1 per cent reported in the prior-year period. “Our growth strategy is paying off. Our strong operating performance and our profitable acquisitions are the basis for our strong results in the second quarter. The newly acquired Chemtura businesses are already making a significant earnings contribution, and the other areas of our speciality chemicals portfolio are also developing positively,” said LANXESS CEO Matthias Zachert. Due to one-time exceptional charges, net income was EUR 3 million, after EUR 75 million in the prior-year quarter. The one-time effects resulted from the Chemtura acquisition and the planned closure of chrome chemicals production at the Zárate site in Argentina in the fourth quarter of 2017. Adjusted for these effects, net income increased by around 75 per cent to EUR 141 million, compared with EUR 80 million in the second quarter of 2016. “We are overall well on track and continue to expect record earnings for the full year. However, compared with the very strong prior year, we are anticipating a slightly weakened momentum for the second half of 2017,” said Zachert. LANXESS continues to forecast EBITDA pre exceptionals for the full year 2017 of between EUR 1.225 billion and EUR 1.3 billion. The company achieved its highest operating result to date in 2012, when it posted a figure of around EUR 1.2 billion. At the end of April, LANXESS completed the acquisition of the US chemical company Chemtura and subsequently adjusted its Group structure. With immediate effect, LANXESS is reporting on five segments comprising a total of twelve business units. The Advanced Intermediates segment covers the intermediates and agrochemicals businesses. The new Specialty Additives segment bundles additives activities. The Performance Chemicals segment is made up of the business units responsible for color pigments, leather chemicals, material protection products and water treatment technologies. The Engineering Materials segment comprises the businesses for high-performance plastics and urethanes. The ARLANXEO segment encompasses the synthetic rubbers business. In segment reporting, prior-year figures were restated where necessary. Sales of the Advanced Intermediates segment in the second quarter of 2017 were EUR 505 million, 14.0 per cent above the prior-year figure of EUR 443 million. EBITDA pre exceptionals increased by 10.2 per cent to EUR 97 million, compared with EUR 88 million a year earlier. Positive effects came especially from higher selling prices and the contribution from the new Organometallics business unit. The EBITDA margin pre exceptionals was 19.2 per cent, against 19.9 per cent in the prior-year quarter. Sales in the new Specialty Additives segment climbed by 106.6 per cent to EUR 440 million, compared with EUR 213 million a year earlier. EBITDA pre exceptionals advanced by 67 per cent to EUR 75 million, compared with the prior-year level of EUR 45 million. This positive development was primarily due to the contribution from the newly acquired Chemtura businesses. Higher volumes also supported this effect. The EBITDA margin pre exceptionals of 17.0 per cent was below the high level of 21.1 per cent reported in the prior-year quarter. Sales in the Performance Chemicals segment rose by 11.2 per cent in the second quarter of 2017, to EUR 367 million, against EUR 330 million a year earlier. 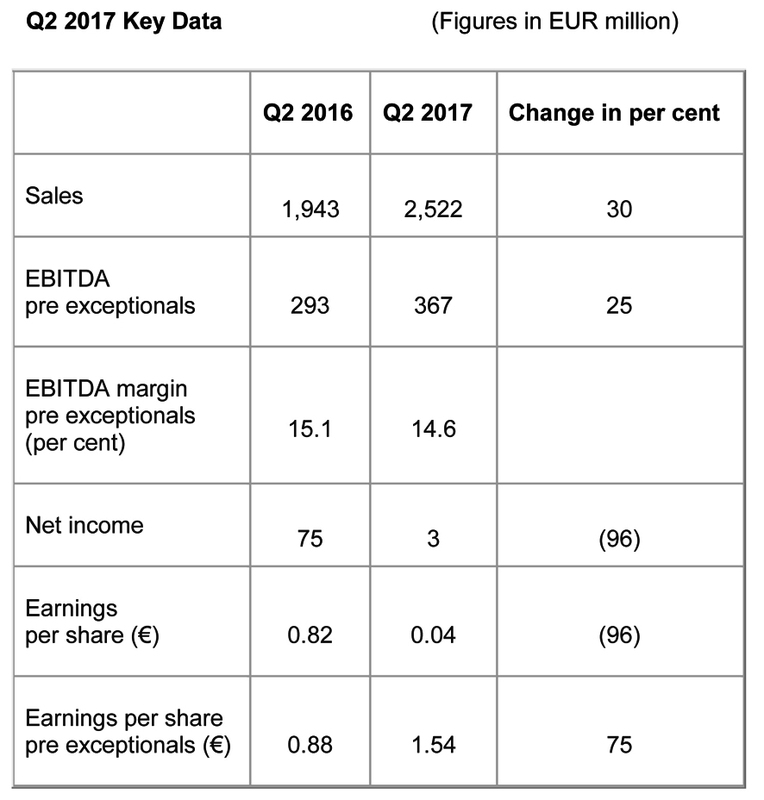 EBITDA pre exceptionals advanced by 15.9 per cent to EUR 80 million, compared with the prior-year level of EUR 69 million. Higher selling prices and the Clean and Disinfect specialties business acquired in 2016 had a positive effect on earnings. The EBITDA margin pre exceptionals increased from 20.9 per cent to 21.8 per cent. In the new Engineering Materials segment, sales increased by 31.3 per cent to EUR 361 million, up from EUR 275 million a year earlier. EBITDA pre exceptionals increased by a substantial 60.0 per cent, from EUR 45 million to EUR 72 million. The newly acquired urethanes business from Chemtura made a particular contribution to improved earnings. Higher volumes, higher selling prices and very good capacity utilization also contributed to the positive development of earnings. The resulting EBITDA margin pre exceptionals of 19.9 per cent was significantly above the figure of 16.4 per cent posted in the prior-year quarter. Sales in the ARLANXEO segment climbed by 24.6 per cent to EUR 835 million, compared with EUR 670 million a year earlier. EBITDA pre exceptionals decreased by 3.0 per cent to EUR 92 million, compared with EUR 95 million a year earlier. Higher energy costs in particular stood against the success in passing on increased raw material costs. The EBITDA margin pre exceptionals was 11.0 per cent, against 14.2 per cent a year earlier.